Oh delicious. So tasty. So chocolatey. So malty. A quick look at the calendar reveals it's March, and that means, Robin's Eggs. I absolutely love Robin's Eggs. Imagine a Whopper, but with a thin candy shell. The lovechild of a malted milk ball and an M&M, with none of the awful after taste. Being such a fan of the malty delight, I decided I wanted to know more about them, where they came from, the genius who came up with them, who paints the speckles, why the normal sized ones showcase quality over quantity, basically everything there is to know about Robin's Eggs, I needed to know. But, much to my horror, I so did know everything about them. I called up George Jones, a product designer at Hershey's. I figured my contact on the inside would know a thing or two about why such a delicious product remains so scarce on the shelves 11/12 of the year. We had the following conversation. But before he could finish that sentence, I had already hung up the phone. 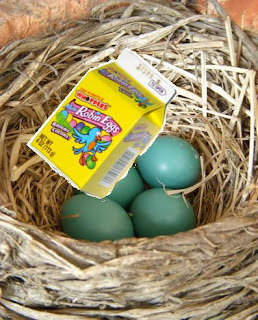 With just a slight slip of the tongue, this sexual deviant candy designer had let out the biggest secret of any candy season—Robin's Eggs are actually robin's eggs. Please take note of the capitalization. And for those of you who didn't like grammar class, Robin's Eggs come from real, actual robins. Obviously there's a conspiracy afoot. Robin's were happy before we started eating them, and now are we to believe they're still happy? The happy-go-lucky robin on the cover would certainly seem to make you think that. Also, do actual robins then have malted milk flowing through the veins. We, of course, already know they have a thin candy shell. In addition, this thing opens up a whole can of worms. Such as vegans who ate Robin's Eggs because they taste so much better than kelp, no longer can. And every time I power through a 33 ounce bag during my mid-morning snack, I have committed genocide on one of the friendliest birds around. Worst of all, those robins probably ate the can of worms before laying their tasty children., which means I have now eaten worms. What a bizarre bargain, I want candy, I get worms. And not candied worms at that. Although this has kind of blown my mind, I'll still eat Robin's Eggs. Why? Because they're still delicious. And if I stockpile a lot of them, I'll have some excellent lunchtime trading fodder. Hopefully they don't hatch before September.